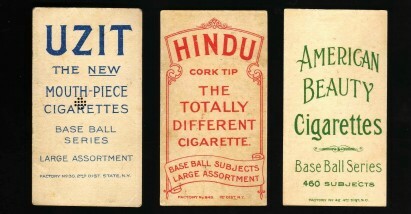 subjects were printed with the rare red HINDU backs. 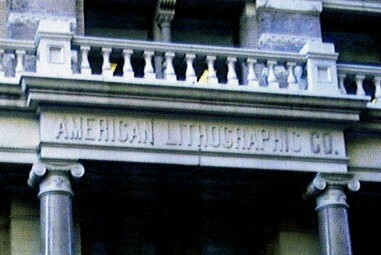 Near the end of the T206 press runs (circa late 1910-early 1911), American Lithographic separated the 63 subjects in the 350/460 series into 2 print groups (refer to Post #8). Listed here are 8 subjects from this group that have yet to be discovered with BL 460 backs. 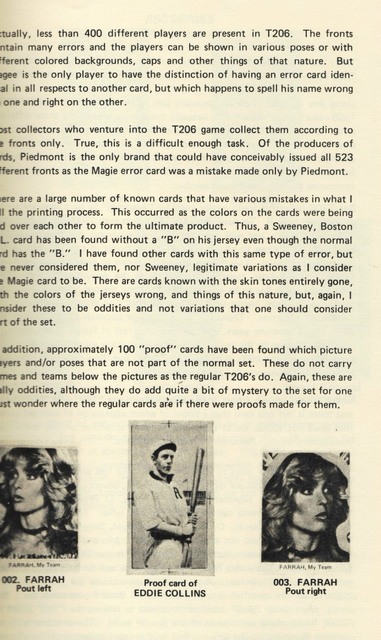 NOTE....that the 460-only series subjects were NOT printed with the BROAD LEAF 460 back. 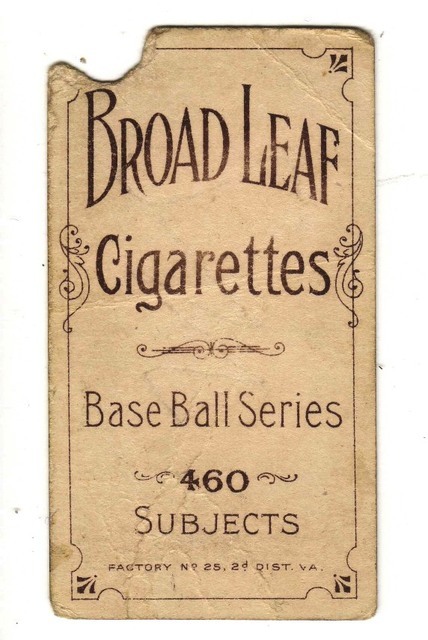 If you have them, show them....never tire of seeing BROAD LEAF 460 cards. Ted, here's my one and only. Note: this is an old scan. 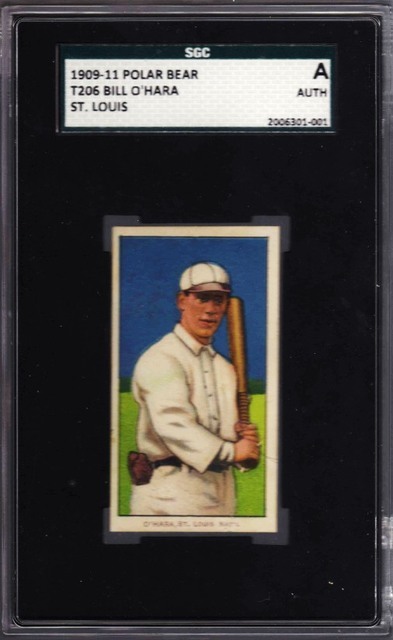 The card now resides in a PSA holder. We get these BROAD LEAF's in what ever shape their in....cannot afford to be "picky"....this one was mine (traded it recently). Let's see some more BL 460's....condition is immaterial. I love reading anything ted posts makes my day. Stayed tuned, more T206 info will be forthcoming. 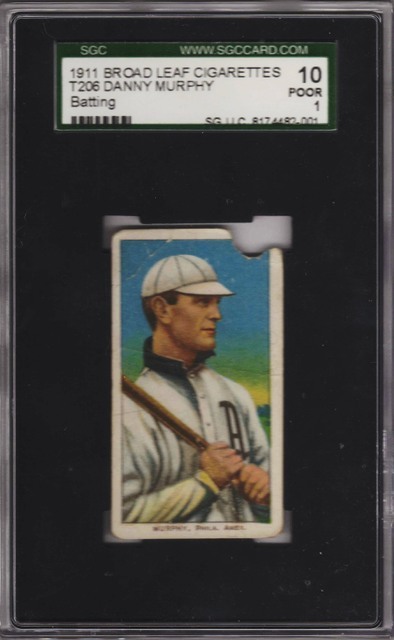 Continuing on the BROAD LEAF 460 theme, this Feb 2006 thread.... T206 Broad Leaf 460 cards is one of the very first (if not the first) to be posted on this subject on Net54. 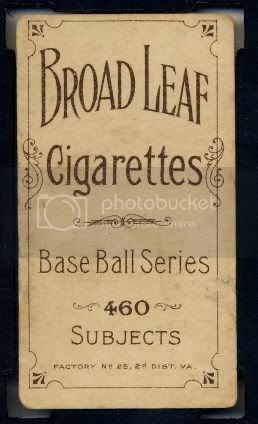 Check-it-out, it's quite an interesting thread......especially, Art Martineau's post (#35) in which he identifies 26 of the 27 subjects we now know of with BROAD LEAF 460 backs.
. OK, I'll try again....if you got them, show off your BROAD LEAF 460 cards. 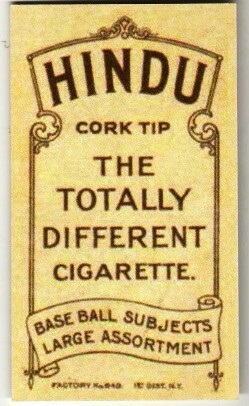 They certainly are a fine credit to anyone's T206 collection. Last edited by tedzan; 06-10-2017 at 09:50 PM. Reason: Correct typo. 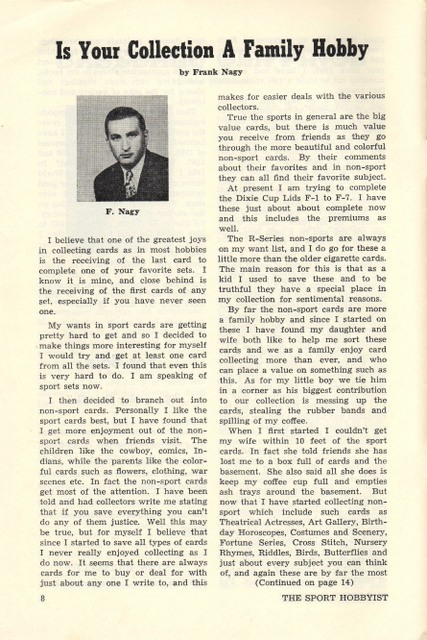 Here is the 1st issue (1962) of The Sport Hobbyist. Charles Brooks and Frank Nagy were it's co-founders. Most of us old-timers have fond memories of Frank Nagy. he would often reduce the amount of your winning bid because the closest bid to it was considerably less than yours. Now, how can you beat that ? Lajoie's, Matty's, and CYoung's, etc. for less than $10 each. 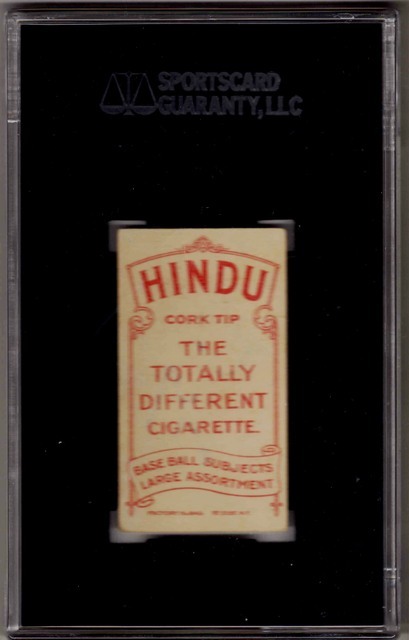 better understanding of the complexities of this set; and, also enlightened us and motivated us to go after the elusive rare T206 backs. 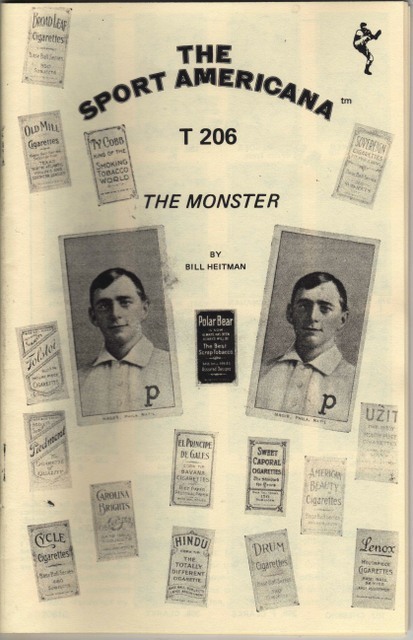 And, here's a thread dated March 2007, where Bill chimed in regarding the Wagner strip...... A T206 printing question for Bill Heitman, or anyone ? I have some more responses from Bill around the 2005 - 2007 time period. I will add them later. Last edited by tedzan; 11-28-2018 at 05:44 PM. Reason: Corrected typo. The stylistic design of the CAROLINA BRIGHTS (CB) backs is one of the best of all the T-brands. 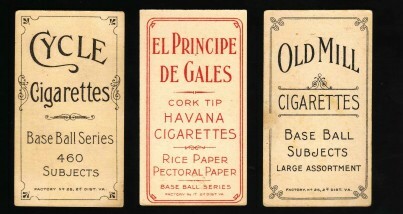 American Litho printed these backs during their 350-only series press runs. My research indicates that 132 subjects were printed with the CB backs. Our Net54 resident expert on the CB's is Brian Weisner....perhaps he may chime in here and share with us his knowledge. 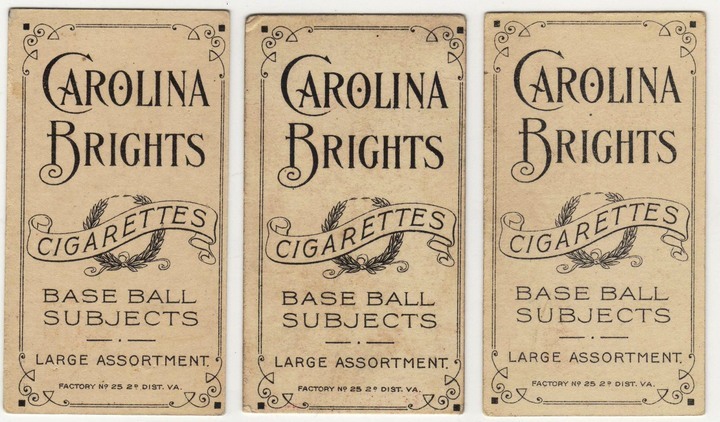 Here are my CAROLINA BRIGHTS cards (I traded Clymer to Brian Weisner some years ago). How about posting some of your CB's here ? 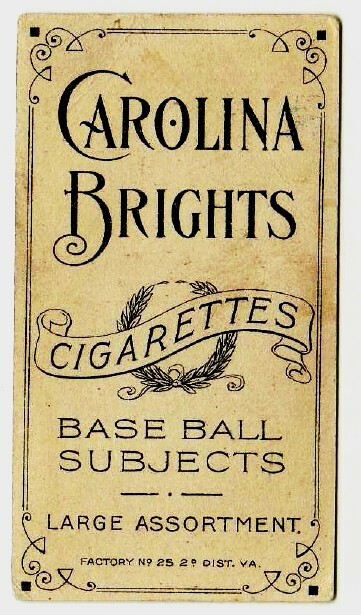 To date, 128 subjects have been confirmed with CAROLINA BRIGHTS. This list is still a work in progress. We are nearing completion, as there are only a few more new CAROLINA BRIGHTS to be discovered. 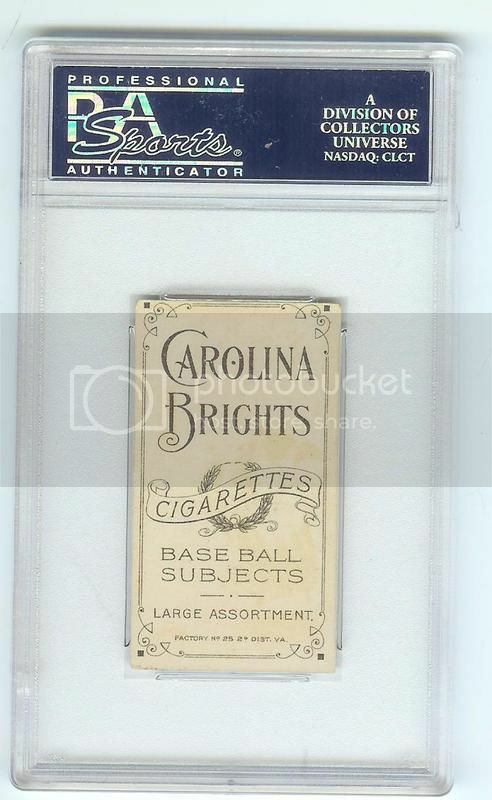 Recognition goes to Brian Weisner and Art Martineau, who have researched the CAROLINA BRIGHTS cards for many, many years. Last edited by tedzan; 06-28-2017 at 09:49 PM. Reason: Update scans. Great looking Carolina Brights McAleese. Thanks for posting it, guy. I'd like to post some pictures but I feel like i'm always the under bidder. So, I don't have any to show. I would really like my first CB to be a Hal Chase Blue Portrait. Last edited by Ronnie73; 06-21-2017 at 08:26 AM. Currently, my blue Chase run includes 21 different T206 backs......the 2 missing backs in this run are CAROLINA BRIGHTS and DRUM. Very nice Red Hindu. I still need many of the tougher backs such as Broad Leaf's, Carolina Brights, Coupon Type 1, Cycle 460, Drum, Hindu Red, and Lenox's. 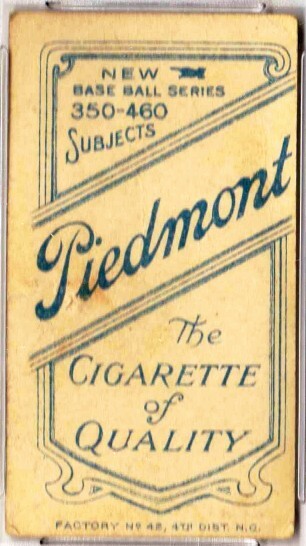 My first Blue Chase, a PSA 4 Piedmont 42 was acquired in early 2011. 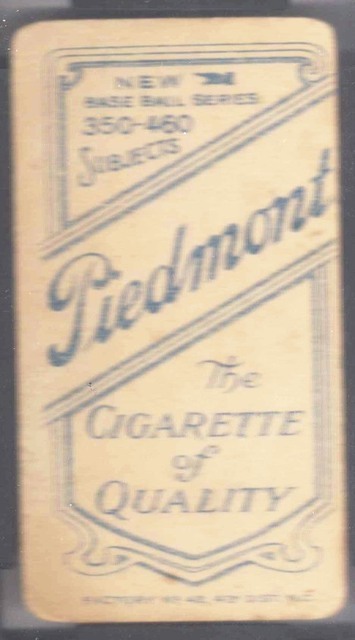 Here's my PIEDMONT 460/42 blue Chase. All my Pd/42 cards are printed with the light blue ink. Do you have any of them with the dark blue ink ? Last edited by tedzan; 07-14-2017 at 06:01 AM. Hi Ted, I have two with the darker ink. One is Rube Marquard Pitching Follow Through, and the other is Arlie Latham. One lighter blue and one dark blue. Pardon me for having a "senior moment". 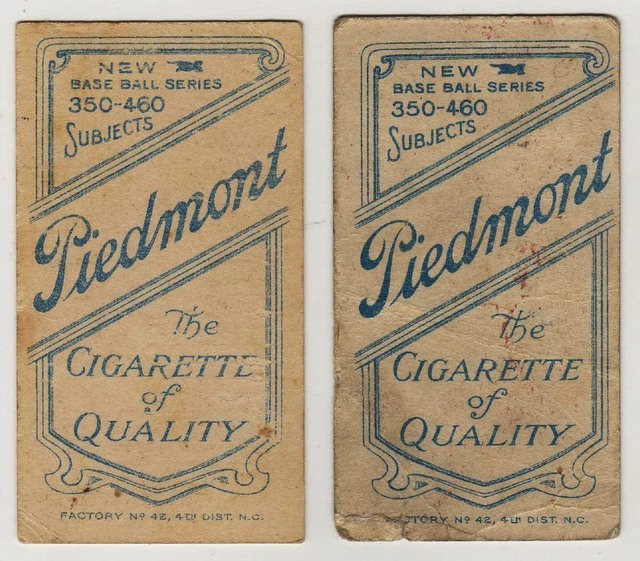 I forgot about the trimmed PIEDMONT 460/42 cards that I have stashed away in the archives. Obviously, they are the dark blue ink variety. With the exception of Chase (who is part of my blue Chase run), I've traded (or sold) most of my PIEDMONT factory #42 cards. And, I do recall that I sold this Latham to Adam G.
Last edited by tedzan; 07-08-2017 at 02:53 PM. It's interesting to see light and dark ink variations of the same cards. I know it was talked about in a post years ago. I wonder if there's a dark ink variation of blue portrait Hal Chase. I've only seen light ink variations on his card. are found on the Polar Bears. 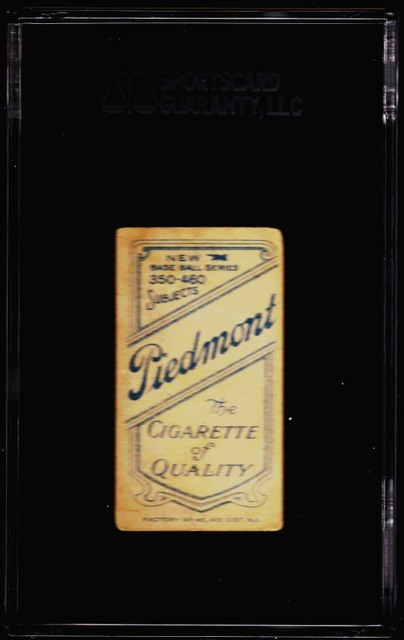 I posted years ago regarding PIEDMONT 42 and UZIT cards. Oh No ! Another "Ted T206 theory". Do they ever end ? the Liggett & Myers Factory (#42) in Durham, NC. Last edited by tedzan; 06-29-2017 at 12:08 PM. Reason: Correct typo. Last edited by tedzan; 06-26-2017 at 09:02 PM. Sorry I have been AWOL for quite a while. Interesting theory about P42/Uzit light/dark blue. Did I miss something w/r/t P42 confirmations? Are there differences in confirmations between light/dark P42? If so, perhaps a separate checklist is warranted (like Sov 350 Apple/Forest Green). We could even come up with a name like baby/royal blue (although I hate the term "baby") that emphasizes the difference. That's part of the fun! Last edited by sreader3; 06-25-2017 at 08:52 PM. This is my current checklist. Do you have any other 460-only series guys to add to this list from your surveys ? 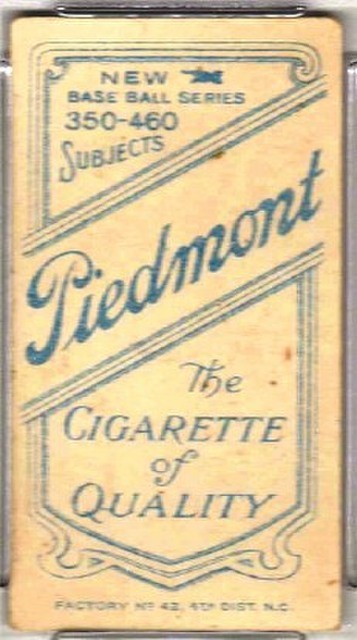 With the recent discovery of Tinker (bat off shoulder) the confirmed total now is 72 subjects with the PIEDMONT 460, factory #42 back. Other Net54 sources claim that the following 4 subjects are confirmed. 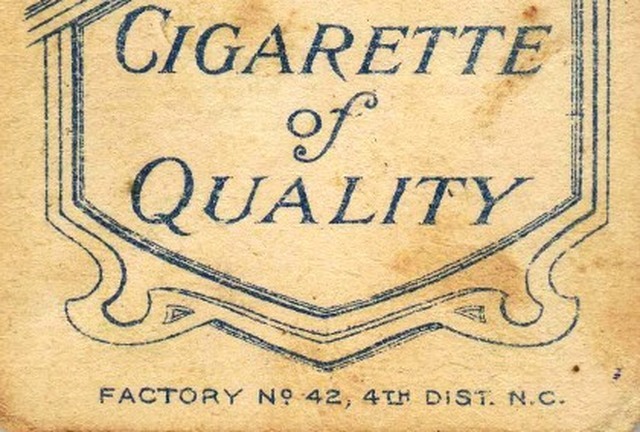 My research indicates that these 4 subjects are PIEDMONT 460, factory #42 No-Prints. Last edited by tedzan; 09-21-2017 at 10:05 PM. Reason: Correct typo. Hey Scot, that's exactly what my girlfriend calls my Plank: the Baby Blue Plank. And I hate that term as well. Nothing to add to Ted's P42 list. I keep thinking I have seen Murray (Portrait) P42 some time in the distant past but you know how the mind can play tricks about such things. I'm probably confusing it with Schlei (Portrait) or Seymour (Portrait). Last edited by sreader3; 06-26-2017 at 12:59 PM. 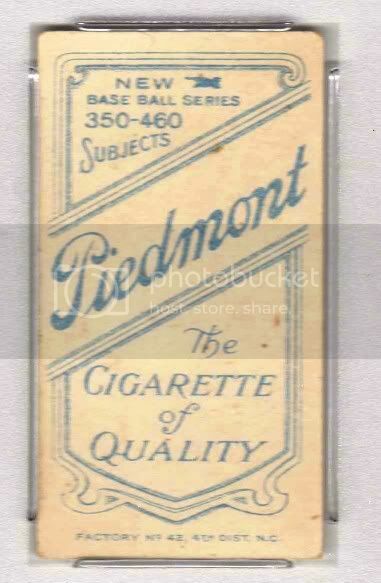 I too, some years back thought I has seen a PIEDMONT 460/42 of Murray (portrait). Since then, though, I realize I was mistaken. Last edited by tedzan; 07-13-2017 at 07:49 PM. Reason: Correct typo. 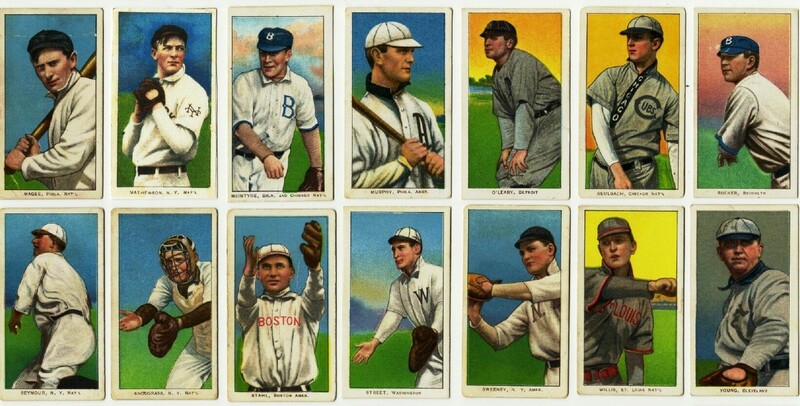 Why no Connie Mack, Jack Coombs, Shoeless Joe Jax, Smoky Joe Wood, etc. in T206 set ? Here's his E96 card. And, of course he can be found on various E-type cards. 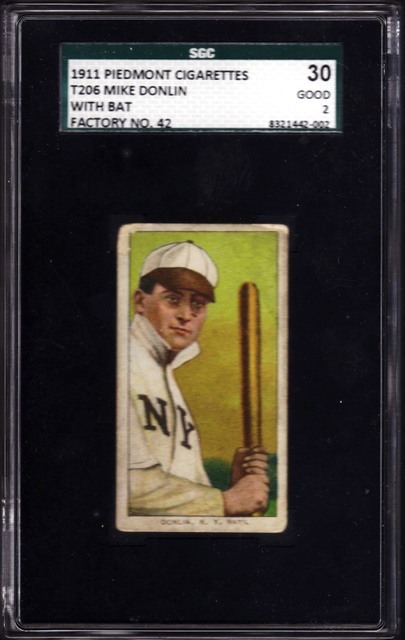 One of notoriety is the E104-1 set which features the 1910 World Champions A's. which of course is a tobacco issue. would often personally scout the College guys, or his brother (Tom) would. I highly recommend this book. 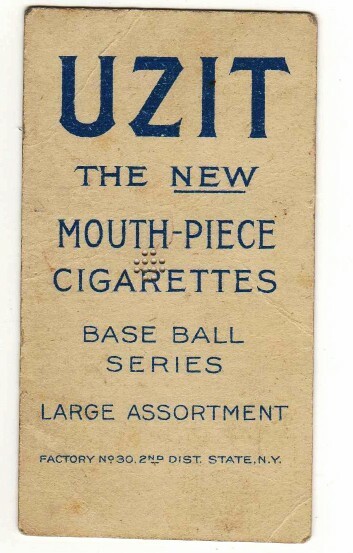 While reading it, you'll imagine the guys in your T206 set come alive. Almost every player from that era is covered in this book. Last edited by tedzan; 07-14-2017 at 10:32 PM. Reason: Added new info. 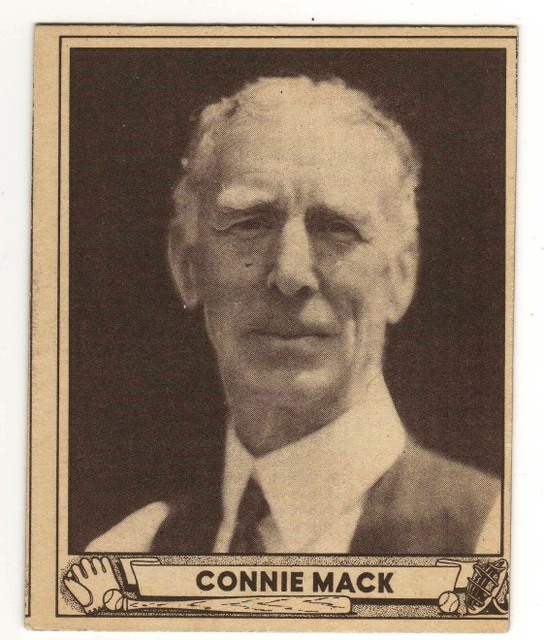 Connie Mack recruited most of his ballplayers from College. He felt they had better training and they could think better than players from the farm system. Jack Coombs is a perfect example of Connie's recruiting style. Jack was a 4 sport (baseball, basketball, football and track) athlete at Colby College (Maine). Is that a record, or what ? World Champions A's. 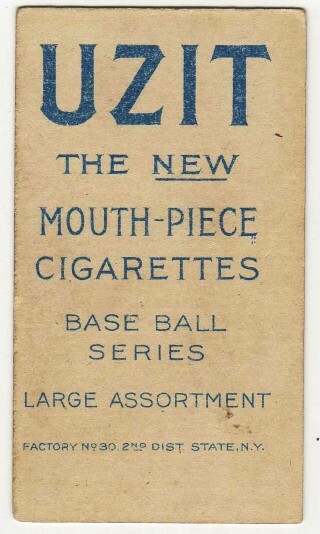 The same printing firm produced both of these sets. Last edited by tedzan; 07-13-2017 at 08:41 PM. Reason: Correct typo. 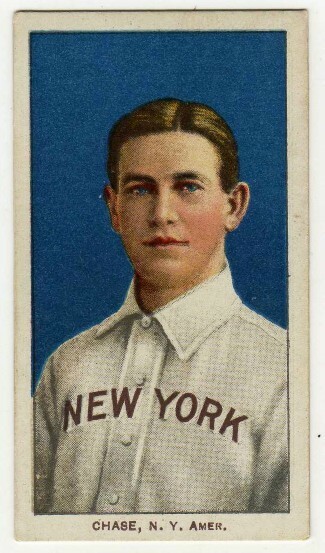 Connie Mack recruited Joe Jackson in 1908, and Joe started with the Philadelphia A's in Sept 1908. Joe's style just did not fit in with the "College Boys" on the A's. 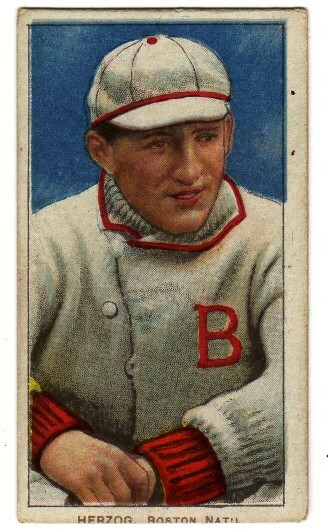 Joe played in only 10 games for the A's (1908 & 1909). 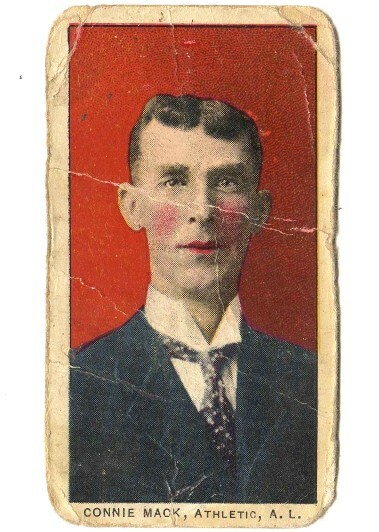 Connie Mack traded Joe to Cleveland in July 1910. 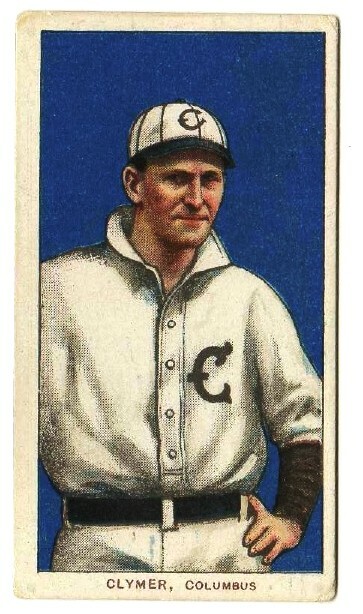 1911 was Joe's 1st full Major Lge. season (147 games). 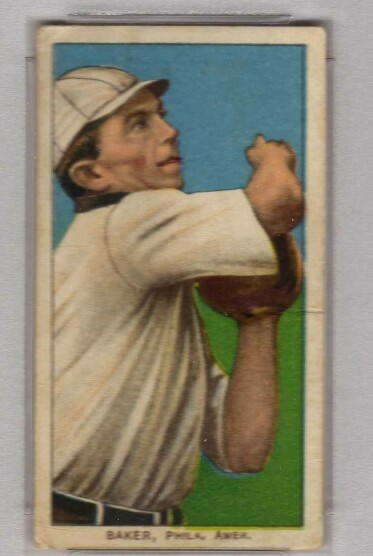 Lithographic (ALC) was introducing T205 cards as late as the Fall/Winter of 1911. But, where was Shoeless Joe ? ? 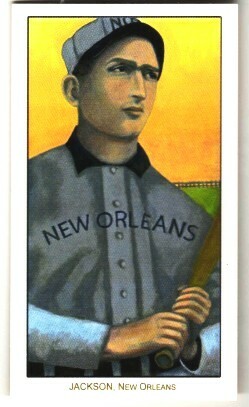 Then in 1912, I would think ALC would have included Joe in their T202 set. But hold it for a moment....is this Joe in this T202 centerfold sliding into 3rd base ? in the T206 set....but no Joe. 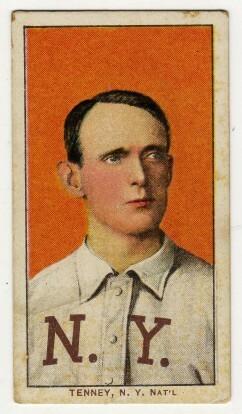 Interestingly, Smoky Joe is even featured in the 1909 American Caramel (E91-C) set. 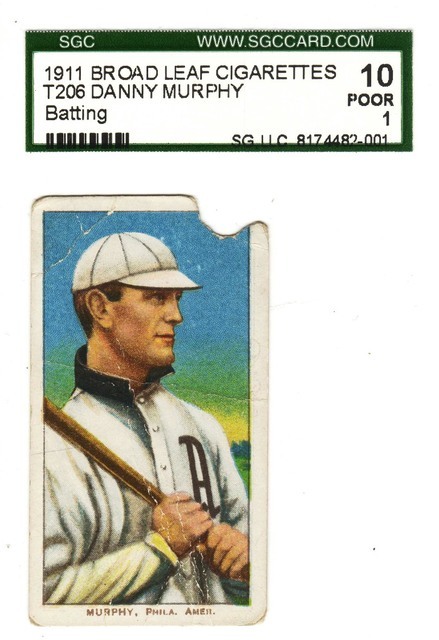 So, I really don't understand why he was not included in the T206 set. Anyone on this forum have any thoughts regarding this omission ? beat the NY Giants in the World Series, winning 3 games (the final game in relief). Your T207 Joe Wood is a beauty. Thanks very much for posting it. 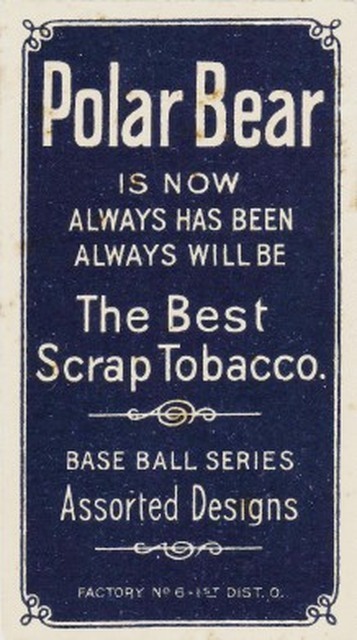 The POLAR BEAR cards were printed at American Litho in NYC, and shipped to the Middletown plant to be inserted in POLAR BEAR tobacco packs. 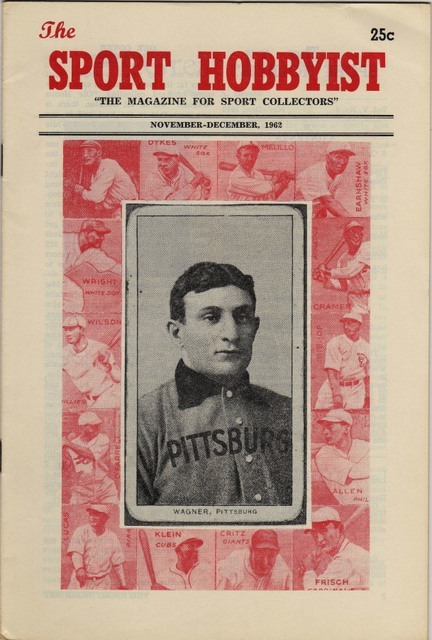 the 1910 season with their respective St Louis teams. 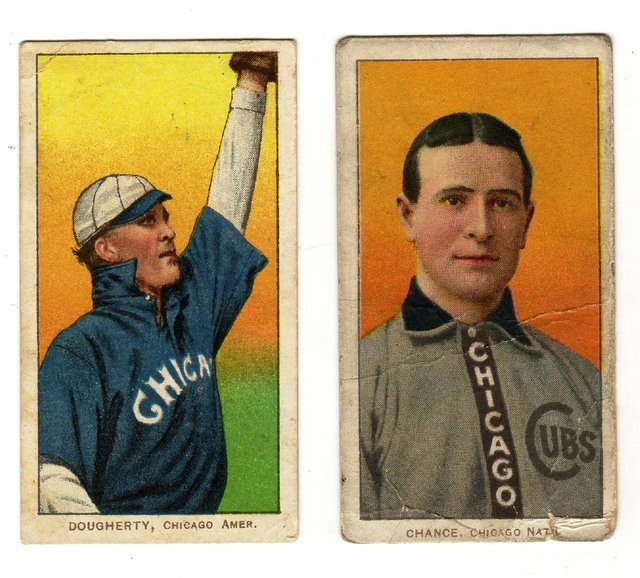 By May 1910, both of them were re-assigned to the Eastern League. 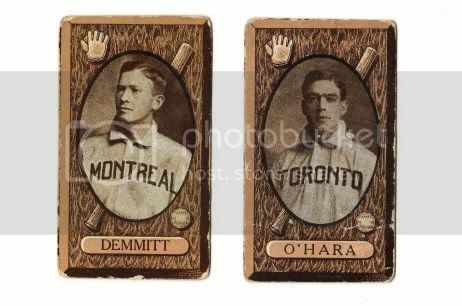 Demmitt to Montreal and O'Hara to Toronto. 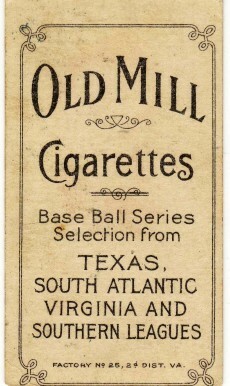 during the Summer of 1910.
press runs when the 350-only series cards were printed. Another school of thought says that they were printed along during the 2nd press runs with the 350/460 cards. 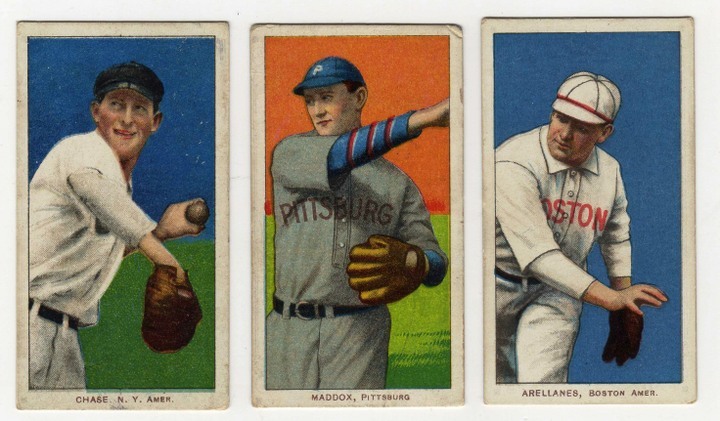 Apparently, American Litho started their 1st press run of the PB cards circa Summer of 1910. ALC printed the PB backs on 138 subjects of the 350-only series. the Demmitt and O'Hara St Louis variations in this PB press run. PB cards. Proof of this theory is evident in T206 surveys, POP report data, and everyday Ebay listings of PB cards. Finally, I would estimate that there are at approx. 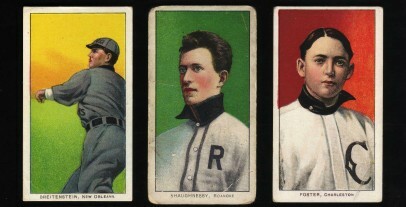 300 cards each of the Demmitt and O'Hara St Louis variations currently in circulation. What is your guesstimate ? OK, having said all this, I'm open to hearing your ideas on this subject ? To date, my checklist indicates 250 subjects have been confirmed with the POLAR BEAR backs. The following lists these cards according to their respective T206 series. Last edited by tedzan; 11-05-2018 at 04:57 PM. Reason: Correct typo. as "350/460 series subjects". I am simply proposing that (with respect to the POLAR BEAR runs) they were printed on the same sheet as the 350/460 series subjects. 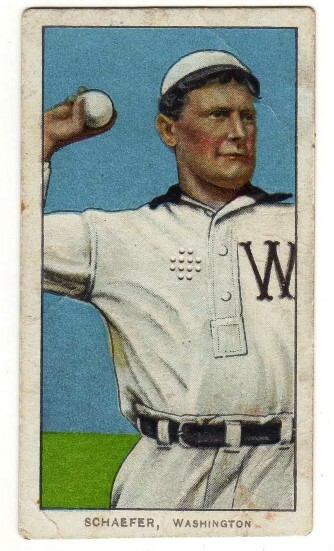 My research indicates that the Demmitt and O'Hara (St Louis) variations could NOT have been printed in the 1st press run of the POLAR BEAR cards with the 350-only subjects. jects were printed with much greater quantities of POLAR BEAR backs. 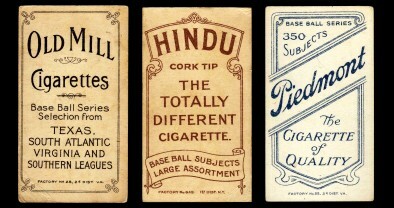 Quantities which are consistent with the numbers of known Demmitt and O'Hara (St Louis) cards. Therefore, with respect to the POLAR BEAR population, the Demmitt and O'Hara (St Louis) variations timeline is very likely circa..Summer/Fall 1910. I have qualified my 350/460 series Checklist, which I've included the Demmitt and O'Hara (St Louis) variations, to note that these 2 subjects were also printed with this group. Interesting theory on the Demmitt and O'Hara (St Louis) variations. I agree that the population numbers are more in line with the 350/460 print group. The sad reality is it makes these two key cards which many consider their base set complete at 518 cards without them, the two most common Polar Bear cards out of the 250 different Polar Bears issued. I'm currently working on a Polar Bear Back subset. I have about 20 to go. I recommend this subset to others. It is a challenge to put together but not impossible. There really isn't any one card difficult (I don't count Dopner in the set) but the difficulty does follow the print groups. During my journey I can say that Print Group 460 is most difficult and Print Group 350 is a bit more easy. Print Group 350/460 cards are almost always available. Polar Bears are condition rare so for a real challenge, a PSA 4/SGC 50 or higher set would keep you busy. 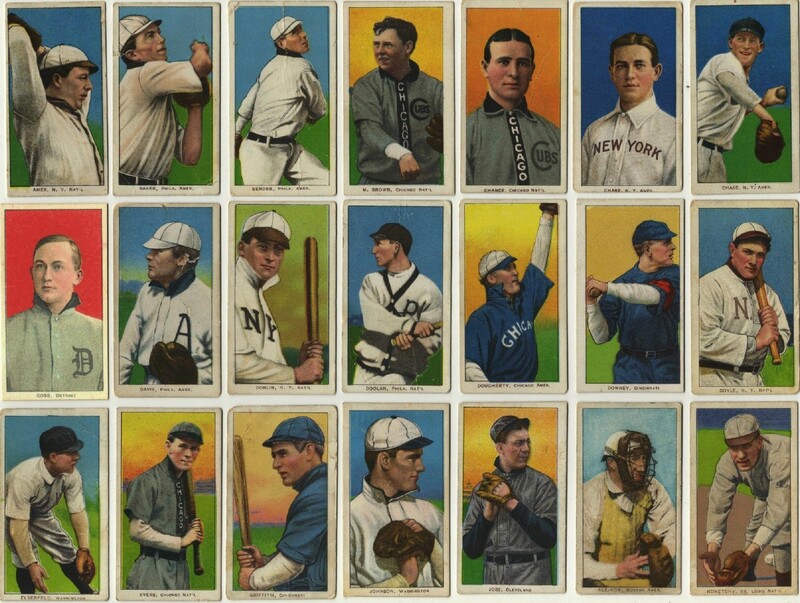 One last thing about the Polar Bear subset is once your done, your nearly 50 percent complete of a 524 card T206 set. I'm impressed, 230 - POLAR BEAR's....that's quite an achievement. must of printed Demmitt and O'Hara (St Louis variations) in the 350/460 press run. Check-out my concept of a 72-card sheet arrangement ** of the Sovereign 66 subjects which I like to refer to as the "phantom 350/460 series". 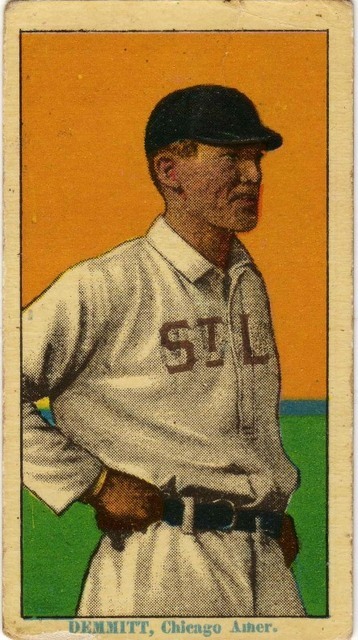 and O'Hara (St Louis) cards. I say it may have been as simple as that. As Mel Allen (great ole sportscaster) would say "How's about that ? ** Note I have shown the 6 super-prints Double-Printed on this arrangement because several large surveys have indicated as such. many of the 350 series commons. The majority of the Demmitt and O'Hara's would be graded even in lower grades because of their value while most of the lower grade PB commons wouldn't. 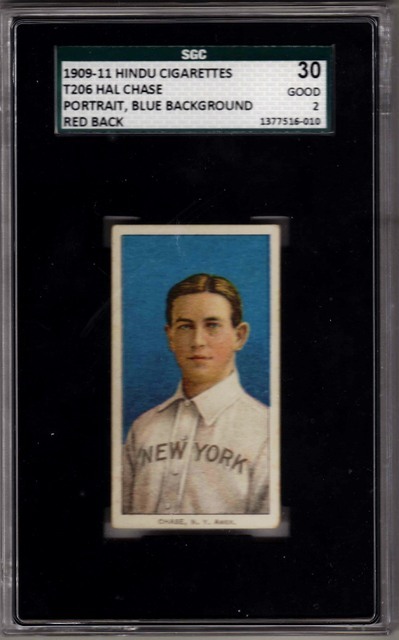 in the 25-30 pop report range with Fred Beck having the most at 37.
you seldom see an ungraded Demmitt or O'Hara's for sale. Of the 111 Demmitt's 37 are lower than a two (1 out of 3) and 29 out of the 101 O'Hara's ( 1 out of 3.4) are below a 2. Only 3 of the 37 (1 out of 12+) of the becks are lower than a 2. With all due respect....where are you getting your numbers ? There is absolutely no comparison with 350-only series PB pop #'s vs 350/460 series PB pop #'s. the differences in printing quantities of PB cards vs 350-only, 350/360. and 460-only series. compared to the 350 series Polar Bears. and O'Hara's would be graded compared to Beck. 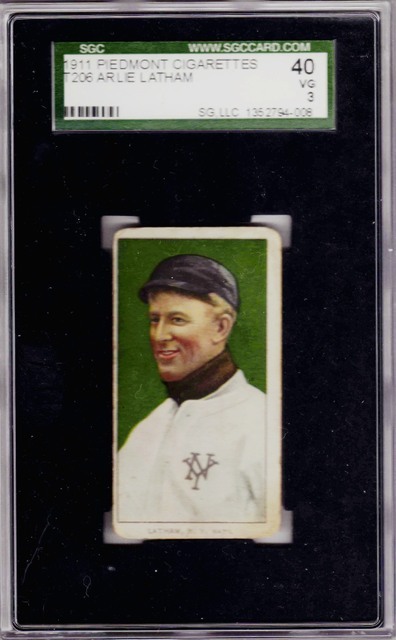 likely to be graded than a Fred Beck Polar Bear? I figured that I would post population totals of Polar Bears for HOF's graded by PSA and SGC combined, broken down in print groups. 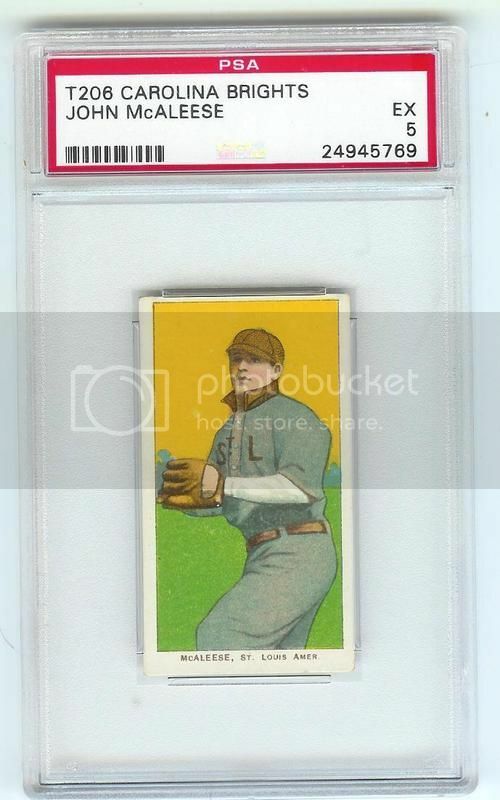 Now I already know that these are just numbers and who knows what has been broken out and re-graded, or what backs are on the graded cards before PSA cared to identify them, or that quantities of cards are not counted from SGC because it was before they were keeping track of player pose. The purpose of this is to show a current average of cards across the print groups at this time. I chose HOF's because they are more likely to be graded than a common player. Last edited by Ronnie73; 07-02-2017 at 07:24 PM. 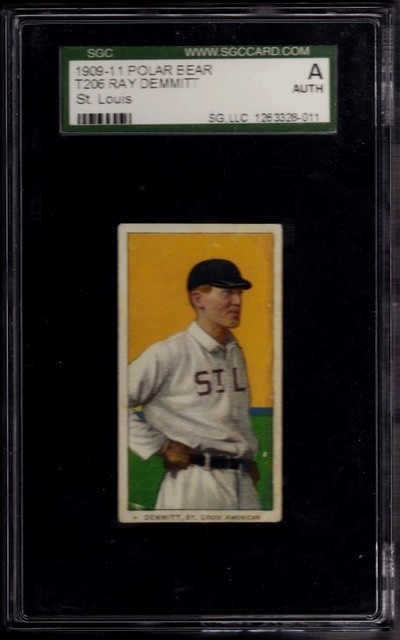 Searching for an affordable Demmitt (St Louis) card ? There is usually one for sale on ebay for about $100 - 200. 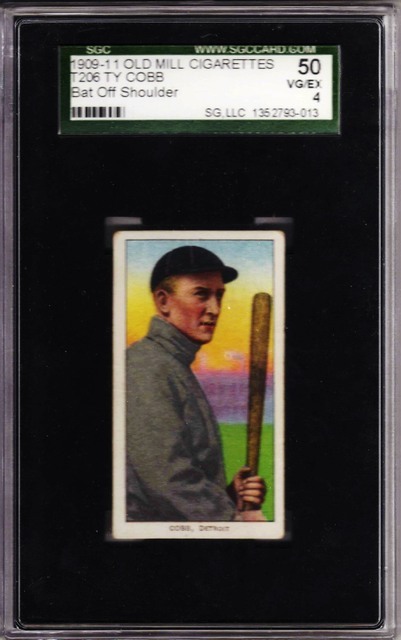 Just think of the $$$$ you save....you can spend it on more T206's. Last edited by tedzan; 12-26-2017 at 10:36 AM. Reason: Added scan. 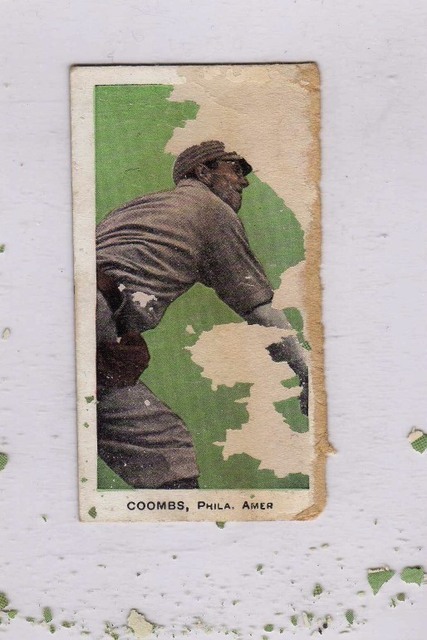 Pardon me for starting this OLD MILL post by first showing you my very first T206 card which I acquired in 1981 at the famous Willow Grove (PA) Show......but, I'm proud of it. 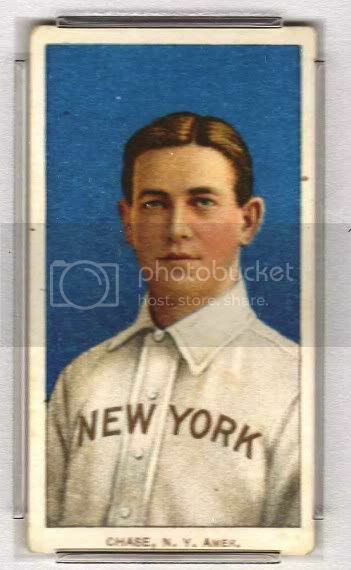 ...besides Walter Johnson, Chase is my favorite player from the deadball era. to find on subjects in the 460-only series. 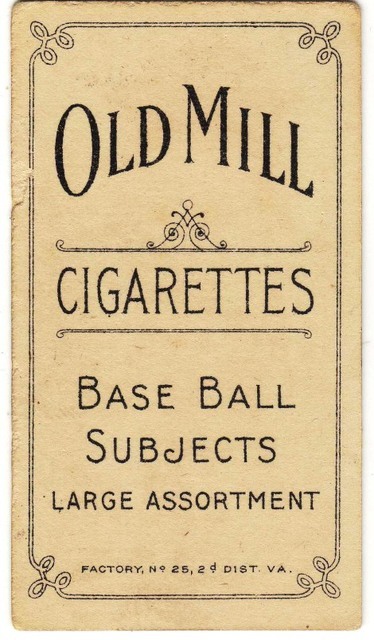 I do not recall of any major finds of T206 OLD MILL (Major Leaguer) cards. Does any one on this forum know of any ? If so, please chime in and tell us of them. cards were all from the 350/460 series, and 460-only series. 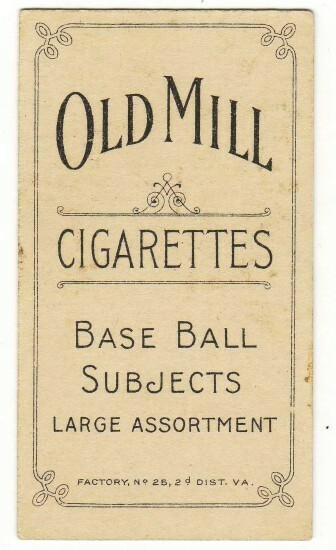 To date....309 black OLD MILL Major League subjects have been confirmed. They are listed here as a function of their respective T206 series. This survey is a work in progress....any new OLD MILL inputs are greatly appreciated. Last edited by tedzan; 11-04-2018 at 05:01 PM. Reason: Added scan. The Old Mill subset is a serious task. I haven't officially focused on the subset yet, even though my Old Mill count is currently at 151. My first Old Mill purchase was a Heinie Zimmermann. My second was a Hal Chase Blue Portrait. My Old Mill SL is complete. 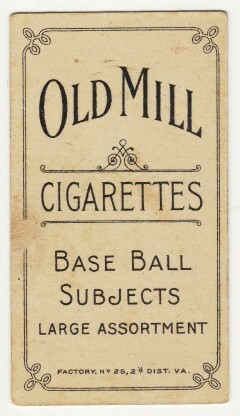 Just doing a search on Ebay for T206 Old Mill's will show that not many non SL's are available. I will most likely focus on the Old Mill's a bit more after my Polar Bear subset is down to single digits. It should be interesting to see if a few more Old Mill's get confirmed. Last edited by tedzan; 07-10-2017 at 04:57 PM. Reason: Correct typo. Interesting Ted. I'm looking forward to reading your theory about why some SL were not printed with a Hindu back. Last edited by tedzan; 07-11-2017 at 02:38 PM. Reason: Modified statement. I have always thought that the print run of the latter 14 SLers started/ended at the same time. Two groups: 34 150/350s and 14 350-onlys. What is your reason for parsing out the 6 Texas Leaguers?